The small conical bill, bold head striping, and long tail tell us that we're looking at a sparrow of some kind. The absence of streaking on the underparts eliminates several groups of sparrows in one fell swoop - the Ammodromus, the Melospiza, as well as Fox, Savannah, and Vesper Sparrows all have streaking on the underparts. Of the Zonotrichia, Harris's Sparrow has a dark head and throat (adults), or a dark breastband (immatures). White-throated Sparrow has a well defined whitish throat and, in most plumages, ventral streaking. The striped head of our quiz bird might recall an immature White-crowned Sparrow but a White-crowned would lack the distinct cheek patch of our candidate. A Golden-crowned Sparrow would have some yellow in the crown. The long tail and reddish back might suggest Bachman's Sparrow, a former breeding species in Illinois but now extirpated. A Bachman's Sparrow however would have a reddish cap and a contrasting buffy wash across the breast. 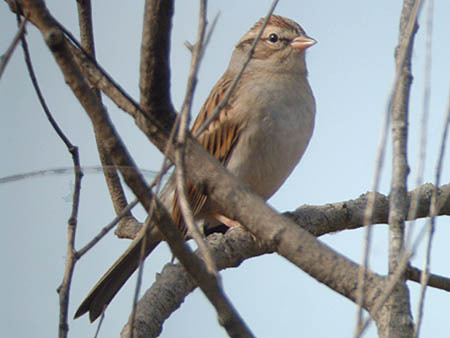 Cassin's Sparrow, a vagrant to Illinois from the southwest, would lack head striping and would show a distinct malar streak. Of all the sparrow groups, our quiz bird seems to fit best in the Spizella, the genus of small long tailed sparrows with plain underparts. Our quiz bird lacks the bold white eyering and reddish cap of Field Sparrow. Also note the dark line between the eye and the bill. This area of the head is known as the lores and is unmarked on Field, Clay-colored, and Brewer's Sparrows. American Tree Sparrow can be eliminated by the unicolored bill and lack of a breast spot. That leaves Chipping Sparrow. This basic plumaged Chipping Sparrow was photographed at Illinois Beach State Park in Lake County, Illinois on October 21, 2006.